Dedicated spring loaded TiGRA adapter for the TiGRA BikeCONSOLE series with its own built in direct to battery hardwire charger supplied as a mount bundle with a 45mm extension arm & 15-17mm (0.59-0.68 inch) fork stem mount base. Hardwire charger powered direct from your bikes battery. Bundle includes a fork stem mount developed for use on motorcycles where a handlebar mounting option is not possible or desirable. Designed to fit sports, superbike, endurance and touring motorbikes using the cylindrical bore wall (steering head tube) of the fork stems. Light weight - made from Aluminium. Attaches easily to the steering head tube of fork stems. IMPORTANT: First check that your stem cover can be removed leaving a central hole for the mount to fix in. 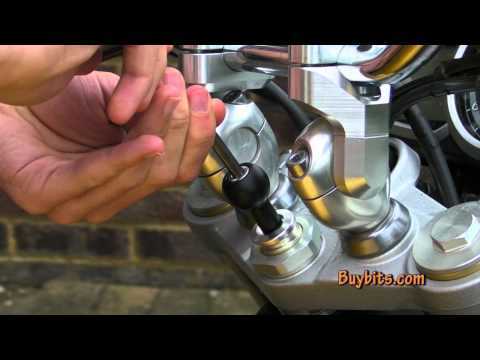 Simply drop the Fork Stem Motorcycle attachment into the hole of the stem and tighten. The split shaft will expand to fit the inside wall of the fork stem Use an Allen Key to tighten to create a tight fit. Mount base developed for sports bikes. where a handlebar mount is not possible. Fits holes 15-17mm (0.59-0.68 inch) Note: BikeCONSOLE case NOT included. Hardwire charger powers directly from bikes battery. fused with bare red/black wires.